my rarely updated, previously secret blog. "The warfare is not against sin; we can never fight sin: Jesus Christ deals with sin in Redemption. The conflict is along the line of turning our natural life into a spiritual life, and this is never done easily, nor does God intend it to be done easily. It is done only by a series of moral choices.....These choices are continually in antagonism to the entrenchments of our natural life, the things which erect themselves as ramparts against the knowledge of God. We can either go back and make ourselves of no account in the Kingdom of God, or we can determinedly demolish these things and let Jesus bring another son to glory." I went on an 8 mile bike ride along the beach...it was super awesome. i want to do that every day. i could have kept on going all day. It's been over a month...But here I am, nonetheless. Better late than never, right? I was tagged, and had to receive a comment telling me to respond, and then even after that had to receive a verbal nag on the phone...So here it goes. I have to write 6 things about myself. 1. I really like getting stuff done. The best days for me are the ones where I wake up and then everything that happens during the day are things I need to get done. For instance - washing/cleaning out my car, updating my iPod, blogging, surfing, working out, organizing things...I love productive days. At the end of them I just feel so...productive. 2. I hate "applications" on Facebook and now unfortunately on Myspace as well. I think they are all really dumb, pointless and very annoying. When I get invitations to be people's "beautiful friend" or to buy and sell my friends, it just really annoys me and makes me think a little less of the sender. Only on Facebook though, not in real life. 3. One of my absolute favorite things to do is to update my iPod. I like making everything perfect, making sure all the artwork is correct and present, and I most of all love spending about an hour looking for new music on iTunes. Music is a huge part of my life so I love dedicating time to it. 4. Sometimes I get urges to yell and be crazy and throw stuff. Not because I'm really enraged or anything, but sometimes I just want to act like it about really insignificant things to make myself and others around me laugh. At work the other day, I was asked to do something really simple that would only take about 30 seconds, and I had a huge block of cheese in my hand...I pretended to get really mad, said some angry expletives, and then pretended like I was going to throw the block to the ground in a fit of rage. I didn't of course, and I did all that so only one of my co-workers could see it...But it was really hilarious, and sometimes I wish I could be that crazy. If for no other reason than to entertain (my co-worker almost fell to the ground laughing and we still joke about it to this day). 5. I really hate B-Movies. I'm sorry. No, they are not entertaining, no, they are not well made, and no, the plots are NOT original or well thought out. Not to mention the acting is ATROCIOUS. I consider myself somewhat of a movie connoisseur. I do like watching well made, entertaining movies with good acting. Not cheesy B-flick horrors with Hershey syrup blood pouring out of people's necks after their head was bit off by a giant rat zombie. Or sometimes worse, cheesy rom-coms where the heart-wrenching scene is really a stomach-wrenching scene. I guess I should also mention here that I am not a fan of science fiction. Nope. 6. Last but not least, I am a huge fan of old music. I grew up listening to music from the 50's, 60's and 70's and some stuff from the 80's. I love the Beatles, The Beach Boys, Bob Marley, The Scorpions, Foreigner, Frankie Valli, Otis Redding, The Bee Gees...Just all the old good music. I occasionally like my music cheesy, but never my movies. I am not going to tag anyone, because the only people I know who blog that I keep up with and know personally that read my blog are Iv, OC and Lis...and they were all already tagged. So there you go. After quite a long absence from blogging, I am back. Since I last blogged (almost 2 months ago! yikes!) I have been enjoying the last fleeting moments of summer, making new friends, and enjoying my now not-so-new job at New Leaf Market in Felton. 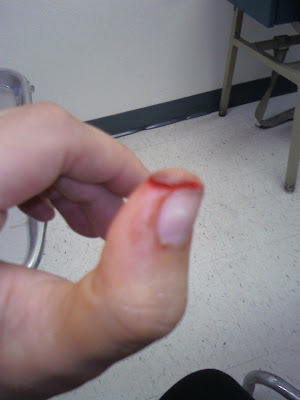 One somewhat exciting thing that happened to me this last week was that I cut my thumb open while chopping onions at work. I have never cut myself so bad! I almost cut the tip of my thumb completely off. I was very flustered when it happened because there was a lot of blood and I was at work so I wasn't sure how to handle it. Luckily a co-worker (Candice) walked me to the backroom, set me up with a bag of cayenne pepper (which apparently stops the bleeding...on small cuts and scrapes - but I don't think they realized how bad my injury was) and a towel. Michelle, my friend in Produce was back there getting some broccoli ready and so she saw how distressed I was and told me stories and interesting facts to keep my mind and eyes off of the injury. Candice got all my first aid needs (ice, towel, band-aid [she really didn't understand how bad it was], etc) and Mark just stood there looking helpless, and tried thinking of anything he could do to help. So after about 15 minutes of non-stop bleeding and pain and filling the bag of cayenne with my blood, we got the Vitamin/Health Specialist Richard to come check it out, and he took one look and said "Woah, go have them stitch it up...That's why we have insurance!" So we called my manager and she said to go to Doctors on Duty, Mark was nominated to drive me, so we clocked out and headed there. Long story short, got a shot to numb the area which hurt like no other and then got 3 stitches in my thumb. Here are a couple of pictures from my cell phone so the quality isn't so great, but you get the basic idea. 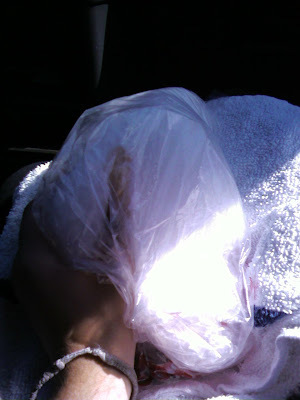 that's my thumb in a bag of cayenne and blood, inside a gnarly bag of ice. 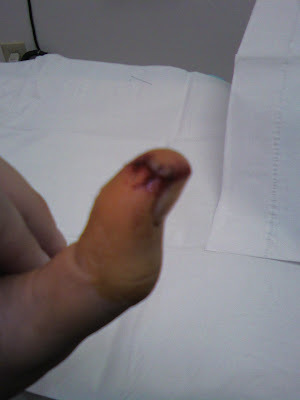 that's my thumb before the operation. ouch! and after. 3 stitches! First time in my life. I know, I know...I haven't blogged in a very long time. I have been pretty busy, and I've had a hard time thinking of things to blog about. But last night (or very early this morning, rather) I was inspired. I saw the new Batman movie, "The Dark Knight" at the midnight premiere. It was completely amazing. This was, in my opinion, the best movie of the year, and overall one of the best movies I have ever seen. The performance, the plot, the acting, the delivery...Everything was perfect. I do want to make a point to give credit where credit is due. Heath Ledger truly outdid himself in his final role as the Joker. It was one of the best performances I have ever seen, and it is tragic that he is not here anymore to get the acclaim he deserves for such a delivery. I hope this is how he is remembered, as a truly talented and gifted actor. The casting in the hands of anyone less capable would have been criminal. He was the perfect fit for this role, and he just did so well. I can't even stress how well he portrayed the Joker. Christopher Nolan really did well on this film, as he has in the past with his others (Batman Begins, The Prestige, Memento) and makes you really think about the moral ethics in the movie, the state of man, and how everyone is capable of the greatest evil, even if they are the "good guy". It's a breath of fresh air compared to the Hollywood code of ethics, where "good" is good, "bad" is bad, and the two hardly ever mix, and no lines are crossed. I really appreciated the deeper philosophies this movie presented, it actually makes you think. Anyway, I think every person needs to see this. It was outstanding. I love summertime, cherry blossoms, national geographics, and bright blue skies.